What is it? – A Small Favor is a fantastic adventure game that puts you in the shoes of an alien assassin asked to eliminate a corrupt Senator. Who made it? – Zeebarf (The Visitor and The Several Journeys of Reemus series) and Caulder Bradford of Diverge Creations. How does it play? – The game controls like your standard point-and-click adventure. 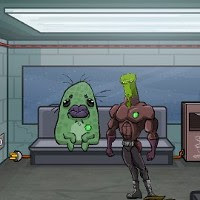 You’ll collect items and interact with other aliens and the environment to solve puzzles. The main story has multiple paths to victory, and the inclusion of some optional side missions add some replay value that’s uncommon to other similar games. Some of the puzzles are tricky, but they’re intuitive, for the most part. Presentation – As with his other games, Zeebarf’s footprint is immediately noticeable. The alien characters are superbly illustrated and animated (no two are alike), and there’s a good deal of humor included. The environments are also very well detailed, and the music and sounds are spot-on. Positives – The story (including its twists and turns) is entertaining and reasonably compelling, and is backed up by characters and environments that are full of personality. The art and animations are cream of the crop, and the optional and branching quests make it impossible to see every outcome unless you play it a couple of times. Negatives – There are some minor interface issues when it comes to combining multiple items from your inventory. Because selecting an item from your inventory will immediately close the inventory screen, you’ll need to open your inventory multiple times to successfully combine items. Why you should play it – If you’ve already played Zeebarf’s other titles, you should already know the answer to this question. If you haven’t, you’re in for a very stylish adventure sprinkled liberally with dark humor. Adventure game fans should not miss checking out A Small Favor.